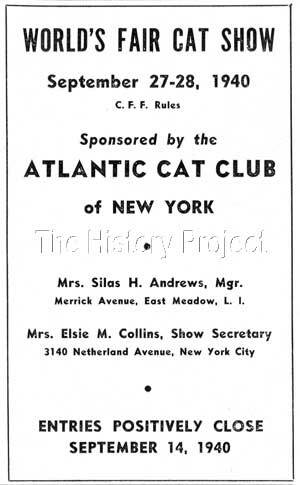 Promoted as 'THE CAT SHOW OF AMERICA', the officials of the New York World's Fair, granted a sanction to The Cat Fanciers Federation, under the auspices of the Atlantic Cat Club, to hold a grand show at the World's Fair Grounds, at Flushing Meadows, Long Island, in the Hall of Special Events, on Friday and Saturday, September 27th and 28th,1940. "Friday and Saturday being two of the best days at the fair we hope to make this the BIGGEST and BEST Cat Show ever held, both in entries and attendance. The grounds are easily accessible from New York City and special rates are given by most hotels and transportation companies. All cat owners are urged to make this THEIR show, THE CAT SHOW OF AMERICA. Come and bring your cats and see the cats of your neighbours and at the same time see the Fair. All exhibitors will receive FREE PASSES to the Fair for both days of the show. So get your cats in condition and enter them in this Show and into the Specialty Club to which you belong. Entry fee $1.25 plus $1.00 additional for Specialty Show. A listing fee of 25c charged for cats not registered in Cat Fanciers Federation. All cat owners are urged to make this THEIR show, THE CAT SHOW OF AMERICA. 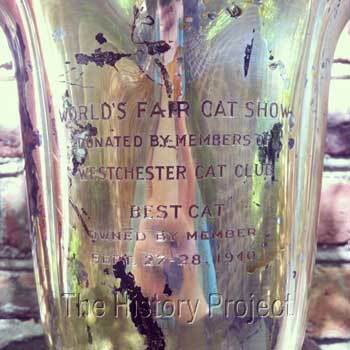 From the above, we must presume that this trophy, which was donated by the Members of the Westchester Cat Club (an early CFA club), would have been among the trophies on exhibition. "World's Fair. N.Y.- Climaxing what promises to be the greatest Cat Show in the annals of the American cat fancy, celebrities of the literary and entertainment world will be on hand for the presentation of awards on the final night of the World's Fair Cat Show, Sept. 27 and 28. 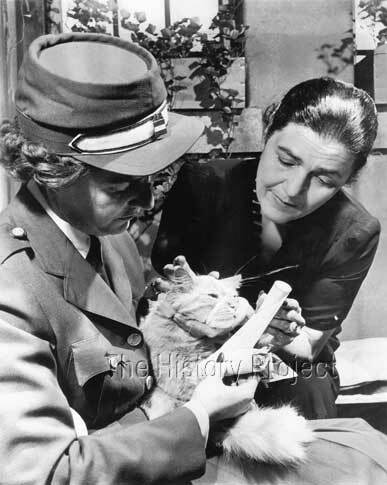 Fannie Hurst, whose interest in the furry felines has long been a matter of public record, has already accepted the invitation of the sponsors of the show to appear at the presentation ceremony and personally award the prizes to the winners. 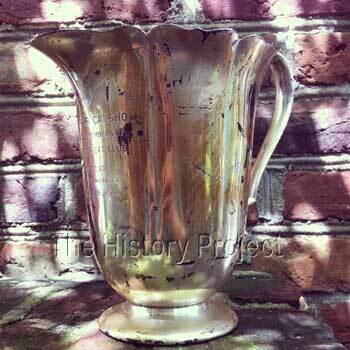 Little Johnny, whose 'call for that famous brand of cigarettes; is familiar to radio audiences all over the country will also be on hand to assist the judges and Miss Hurst making the awards. Other personalities who have been invited to take part in the presentation include Ezra Stone of stage and radio fame, Ed and Pegeen Fitzgerald, and L. Sherwood, three popular radio commentators.